We get used to quietly mysterious round-towered churches, tucked away down narrow lanes, in fields and in the folds of woodlands. 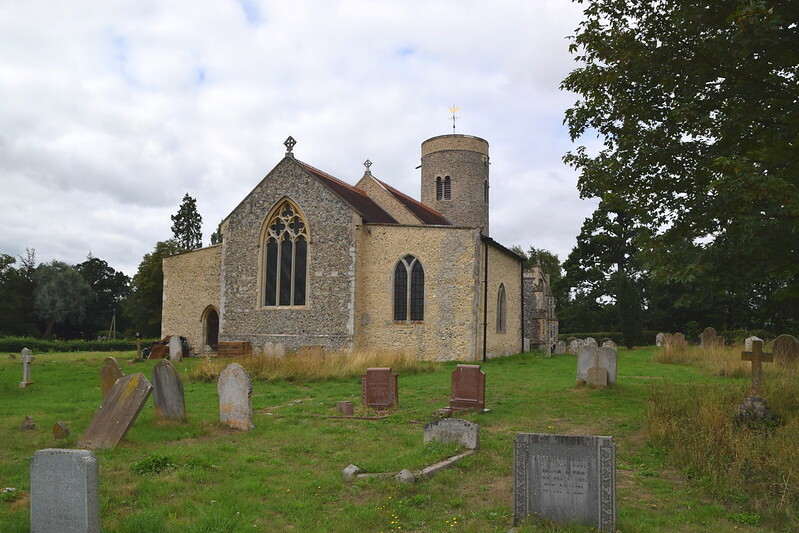 But Gissing is a reminder that round-towered churches can be stately and imposing as well. 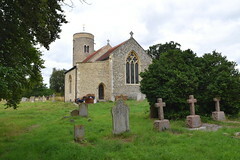 This long church with its chancel chapels sprawls comfortably in the centre of the village, lifting a tower that is almost wholly Norman in character. 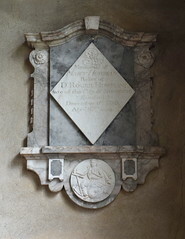 It is one of the best of its period in Norfolk. 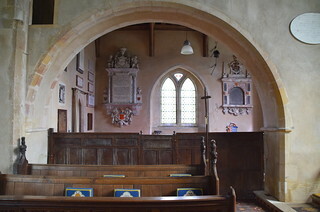 The church, too, speaks more of the conquest than any other period, although there is an ornate two-storey 15th century north porch with image niches and roses in the spandrels. 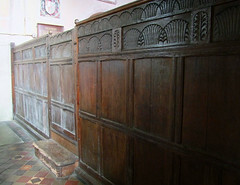 Inside, it hides the original Norman door, which despite being sheltered for half a millennium is more weathered than the exposed contemporary doorway on the south side. 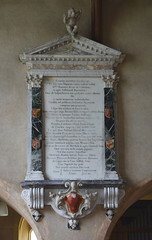 You step into a church which at first sight is narrow and tall, almost tunnel-like, but lifting high into the darkness. 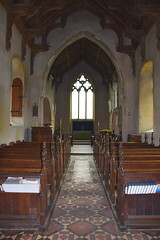 This is because St Mary has a splendid double hammerbeam roof, probably built as part of the same campaign that gave it the porch. I think that the wood must be chestnut. The angels are modern, but the figures in the wallposts, smoothed by the passing of the years, are as stately as the tower outside. 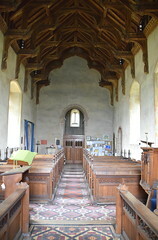 Beyond the nave, the chancel sprawls dramatically to chapels on the north and the south sides. 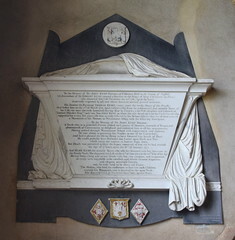 The north chancel chapel is the Kemp family mausoleum, and their memorials line the walls. 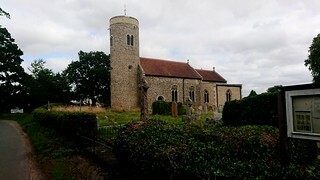 Some are very grand, particularly in comparison with one of the starkest, simplest sanctuaries in Norfolk. 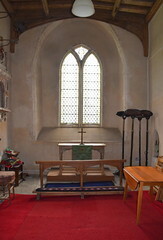 A low, curved arch into the chapel is probably 18th century, and the contemporary screen below it is a curiosity. 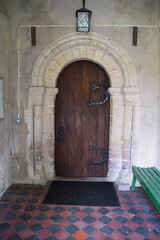 Looking back to the west, the doorways and tower arch are all their Norman originals, which is very pleasing. 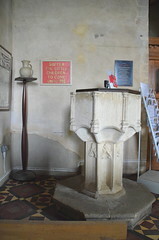 Less attractive perhaps, but more intriguing, is the font, which has blank sides between columned corners. Was it unfinished? Or was it originally painted? 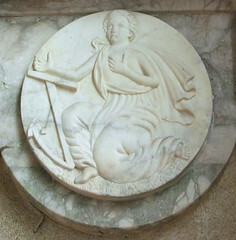 Or, even more interestingly, could it be that the reliefs have been cemented over? The deep niches on the stem must once have held statues, but they are now empty, and offer no answers. 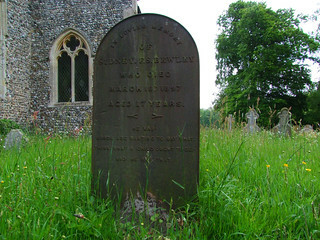 Outside in the churchyard, an anguished inscription on a cast iron grave marker of 1897, probably from a Diss iron foundry, remembers Sydney Bewley, who died at the age of seventeen: He was - Words are wanting to say what. Think what a child ought to be, and he was that.